Perhaps the toughest, best-built manual downrigger available. 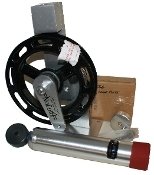 Easy to use "One-Hand-Crank" clutch system. Great quality, built to last and last. A great "workhorse".